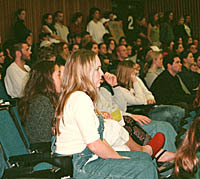 UC Santa Cruz's Academic Senate voted overwhelmingly on Wednesday for a proposal that would make letter grades mandatory for entering UCSC students in fall 2001. The Narrative Evaluation System, a hallmark of the student assessment process at UCSC throughout the campus's 35-year history, was officially unchanged by Wednesday's vote. George Brown, chair of the Academic Senate's Committee on Education Policy, addresses the faculty about the proposal. The 154-77 vote in favor of instituting UC's traditional grading system sets the stage for discussion of the Narrative Evaluation System (NES) at the next senate meeting, on May 31. Introducing the grades proposal at the senate meeting, physics professor George Brown, chair of the senate's Committee on Educational Policy (CEP), promised that his committee would present "compatible legislation" on the NES at the spring meeting. After the vote, Brown said he expected that the CEP would draft a proposal that would "reform" the NES, not do away with it. Speakers at Wednesday's senate meeting repeated many of the arguments raised by faculty and students on both sides of the recent debate over UCSC's student evaluation system. Approximately 150 students came to listen to the Academic Senate's discussion on the grades proposal. Martha Zuniga, an associate professor of biology, said UCSC students who choose not to receive grades--and therefore don't acquire a grade-point average--are disadvantaged when they compete for fellowships against students from other campuses. Others added that a reliance on the NES has impacted UCSC's ability to attract top students and hurts the students when they apply to graduate schools elsewhere. Peter Euben, a professor of politics, saw it differently. Euben said a policy that makes grades mandatory would erode the NES. "I think we have to be clear that is what will happen," he said, adding he would prefer to have the option to "teach without grades and have students learn without grades." Specifically, the resolution approved Wednesday will require students who enter UCSC one and one-half years from now to take no more than 25 percent of their UCSC course work on a Pass/No Pass (P/NP) basis. The resolution, offered by CEP, recommended that the issues of grades and the NES be considered separately "so that the complex matter of narrative evaluations can be subsequently debated, as an entirely independent matter." The new legislation also introduces plus (+) and minus (-) modifiers for grades (A, B, and C only) and will require that a notation of NP be recorded on the student's transcript; the present UCSC policy does not record NP work. Wednesday's vote may yet be challenged as part of the senate's approval process. Those rules permit 25 senate members to request that the matter be presented to all 588 members of the senate via a "mail ballot." Faculty on both sides of the issue expected that request to be made and that a final outcome might not be known for at least two months. The winter-quarter meeting on Wednesday was the first session of the senate since December, when members called a special meeting to consider replacing the NES with the conventional UC grading system. That meeting was prompted by a petition signed by more than 170 members of the senate. By a one-vote margin, the senate in December moved the matter to committee for consideration. The senate's Committee on Rules, Jurisdiction, and Elections subsequently reviewed the parliamentary procedures surrounding that vote and deemed the vote to be "inconclusive." CEP, meanwhile, assumed that it had been given the referral and wrote the legislation that was presented to the full senate Wednesday. The two recent meetings mark the third time in seven years that UCSC's student assessment policies have been the subject of Academic Senate debate. In an informational action intended to guide NES deliberations by the CEP, senate members participated in a spirited debate in June 1993 before voting to maintain NES in its present form. In the fall of 1996, however, senate members voted by a two-to-one margin to permit new and continuing students to request letter grades for most classes, beginning in fall 1997. The change retained the NES, but enabled new students to accumulate a grade-point average. During this past academic year, approximately one-third of UCSC's students requested grades.